This paper calculates the extent of spending reductions that Alberta would need to make over the next three years to eliminate the province’s budget deficit by fiscal year 2021/22 while also creating the necessary fiscal room for pro-growth tax relief. Alberta’s fiscal situation has been deteriorating rapidly, with the province going from a $31.7 billion net financial asset position in 2008/09 to having $28.1 billion in net financial debt this fiscal year. This is a total net asset decline of $59.8 billion. All this new debt is leading to higher debt service costs. It is estimated that the province’s once negligible debt servicing costs will hit $435 per person by 2018/19, reducing the province’s ability to fund important priorities. This highlights the importance of returning to budgetary balance sooner rather than later. Notwithstanding recent tax increases, Alberta is running large deficits and accumulating debt quickly. Those tax increases have significantly undermined its tax competitiveness and relative attractiveness as an investment destination compared to peer jurisdictions. Until recently, Alberta had the lowest combined top federal-provincial/state statutory personal income tax and corporate income tax rates of any US state or Canadian province. Thanks in part to recent provincial tax increases, Alberta today has the 9th highest top combined PIT rate in Canada and the United States. The provincial government has also increased the province’s general corporate income tax and imposed a new carbon levy. In order for Alberta to meet the dual challenge of restoring its tax competitiveness while also eliminating its large budget deficit, it must make substantial policy reforms and substantial spending reductions. 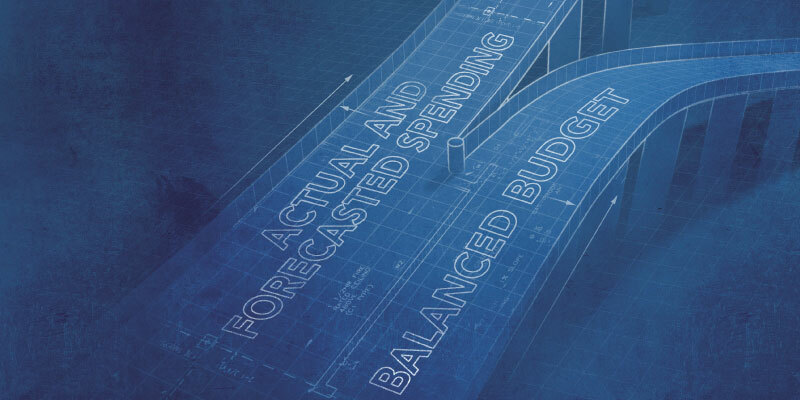 This paper calculates the size of the spending reductions that Alberta needs to make to balance its budget over the next three fiscal years while also creating enough fiscal room for meaningful tax reform and reductions. Specifically, it models the extent of spending reductions that would get Alberta to budget balance by 2021/22 if the province enacted substantial reforms and reductions related to the personal income tax, corporate income tax, carbon pricing mechanisms, and capital gains tax. It finds that to achieve these goals, the provincial government would need to reduce nominal program spending by a total of 10.9 percent over the next three years. This fiscal consolidation is clearly sizable. However, the paper shows there is historical precedent for consolidations on a similar scale. The spending reductions under the Klein government in the 1990s, for instance, were substantially steeper. Further, the paper provides context on the needed reforms in Alberta by showing that program spending in the province is currently 21.5 percent higher than in British Columbia, a province whose public services in key areas including health and education are currently outperforming Alberta’s. Eliminating the province’s substantial budget deficit while also creating room for tax relief and reform will not be easy. However, this study shows that it is possible if the government makes major reforms that substantially reduce provincial government spending in Alberta.